Meet Risa Card and her beloved Double Doodle Riley Sue. Risa’s aunt Tina Cole sent me a message after seeing me on News Center Maine’s 207 in May. I was promoting a series on nursing in Maine and mentioned that National Nurses Day was coming up. I said if anyone wanted to honor a particular nurse to send me his/her name and I would add it to the post Showing our gratitude. Risa is truly amazing. She had a brain tumor a few years back. The nurses and surgeon so inspired her she entered nursing school even with challenges with cognition during the healing process. I am a licensed clinical social worker and teach patients how to transform pain into resiliency and live a meaningful and full life. My niece Risa exemplifies this. I just wanted you to know her. Meet her. You will see what I see. Thank you. Tests revealed a tumor in her pineal gland, which sits at the base of the brain near the top of the brainstem. It’s responsible for producing several hormones, including melatonin, which regulates the body’s circadian rhythm — its sleep/wake cycle. Tumors of the pineal gland are pretty rare, but there are more than a dozen different kinds. The chances of one being malignant are about 50-50. Risa’s tumor was just big enough to block a ventricle in her brain and prevent spinal fluid from draining as it should. The buildup of fluid created pressure and caused her headaches and double vision. The first step in treating the tumor was a procedure called a third ventriculostomy. Using a lighted scope, the surgeon made a burr hole in her skull and another small hole in the floor of her ventricle to drain the fluid and relieve the pressure. Six months later, she had brain surgery to remove the tumor. But once again, Risa’s life came to an unexpected screeching halt. Her two-year checkup showed that the tumor had returned and by that time, the World Health Organization had identified the cell type. It was a papillary tumor of the pineal gland. An extremely rare cancer that was not benign, after all. Risa had brain surgery to remove the new tumor followed by several weeks of radiation therapy. She has been cancer-free for seven years, but the healing process wasn’t easy. The treatments left her exhausted and temporarily interfered with her memory and ability to think straight. 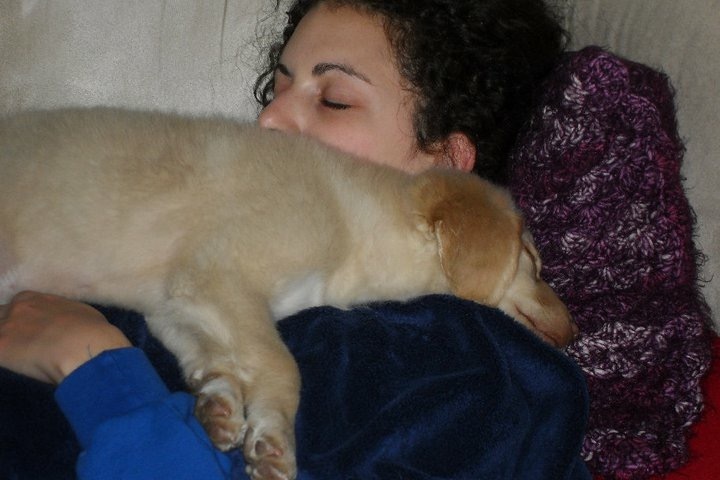 It was about then that Riley Sue came into her life and was always there to give her plenty of love and comfort. Family, friends, and the radiation therapy team at Maine Medical Center were also with Risa every step of the way. One person had such a profound effect on her that Risa decided to change her career path. It was her radiation therapy nurse Jim Kavanaugh. And that is exactly what Risa is today. Somebody’s Jim. Lots of people’s Jim. 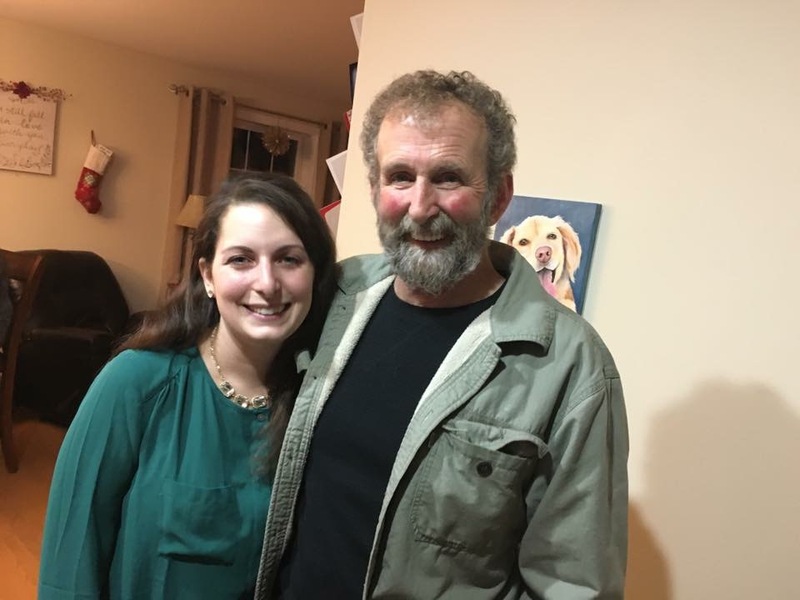 Instead of continuing to pursue a biology degree, she went to nursing school to become an oncology nurse like Jim. Sharing the limelight with her in the picture above is Shirley Jones, one of her patients. Risa works in the Oncology-Hematology Center at Mercy Hospital in Portland. She brings all that she has experienced into how she cares for her patients. Her boss is Dawn MacFarland, who manages the Center and coincidentally, is Jim Kavanaugh’s wife. Risa is a strong nurse with a level of maturity and clinical insight well beyond her years of nursing experience. 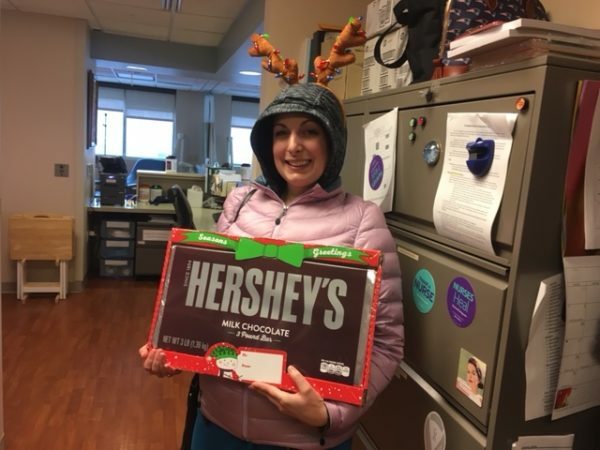 She demonstrates a deep level of care, compassion and understanding for the patient and family with a cancer or life threatening illness, but at the same time demonstrates a high level of humility and levity. She has learned to put things into the proper perspective and understands the importance of laughter. It has been wonderful to watch Risa grow and develop as a nurse and person. 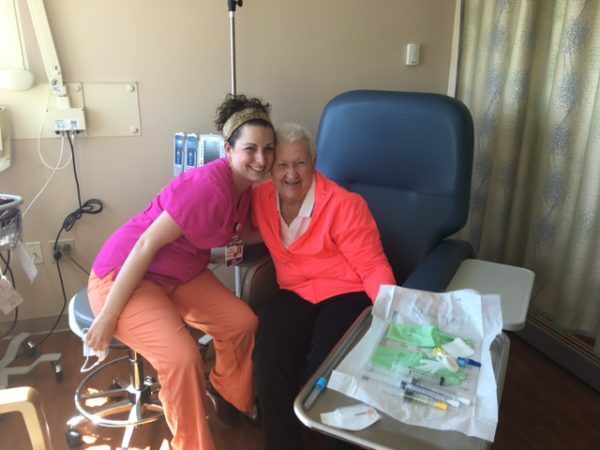 Being a cancer survivor does not define who Risa is as a person or a nurse but it definitely shapes her clinical practice and how she relates to patients and their families. Because of her own cancer journey I believe she has a deeper level of understanding and awareness of the patients experience. She gets it! This awareness and presence as a partner in the patients journey is felt, even though she does not disclose her own cancer experience with patients unless she feels it would be relevant or beneficial to the patient and his or her own cancer journey. I think because she truly understands the implications that a diagnosis of cancer has on a person — she has little tolerance for nonsense — Risa is a get it done and get it done right sort of person. Risa is a champion and advocate not only for her patients but also for her nursing colleagues. She often speaks of her mentor and what a difference that person made in her life. Because of this she readily shares her knowledge and passion for nursing with new nurses and those new to the oncology field. Risa is an amazing mentor and teacher. I often wonder if those she serves as a preceptor to recognize what a gift they have been given and the insights into the cancer experience that they are learning from her. Managers look for employees like Risa, knowledgeable, highly driven, innovative, engaged, compassionate, open to change and professional. I am truly blessed to have such a caring and dynamic nurse on the oncology team, as are the patients who are under her expert care and guidance. The mentor Dawn spoke of was Jim. 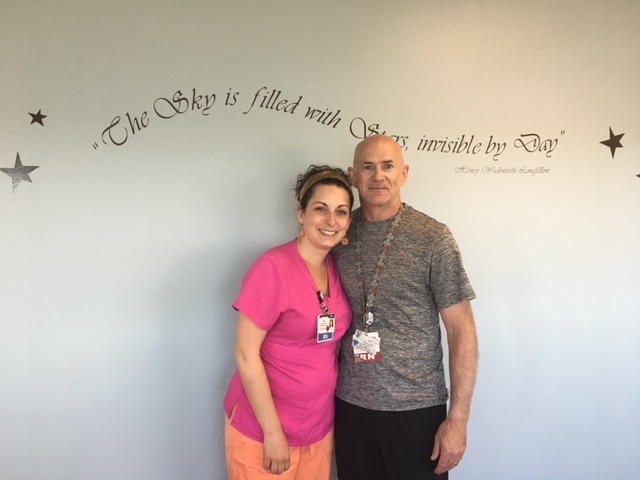 Risa started her nursing career in the oncology unit at MMC, where he took her under his wing and also got her involved in the Southern Maine Oncology Nursing Society. Being Risa’s mentor was nothing but joy. You need to understand that I met her at a stressful time. I was her nurse in radiation oncology as she embarked on her journey of treatment for a brain tumor at a young age. She had just completed her undergraduate degree in biology and this tumor happened. Anyone who has met Risa knows that she has this bright and welcoming personality. She would come almost every day with her mom and I was able to help keep them grounded, informed and calm during this very trying time. Since people receiving radiation therapy come every day sometimes for weeks, I was able to get to know Risa and her mom quite well. It was obvious from the beginning that she was a very intelligent and curious person. She had a passion for helping people and learning new things. We spoke often of what she would do in her future. It was not until she had completed her treatments that I learned she was going to pursue a career in nursing. I couldn’t think of a more perfect career for someone with her gifts. Risa always brought a smiling face, a positive attitude and a willingness to face every challenge bravely. As a board member of the local chapter of the Oncology Nursing Society, I had just proposed the idea of a mentorship program within the group to provide new oncology nurses or nurses who wanted to be oncology nurses the opportunity to be mentored by our group of expert nurses. Risa was an ideal fit for our ‘pilot’ mentee and that is where it started. 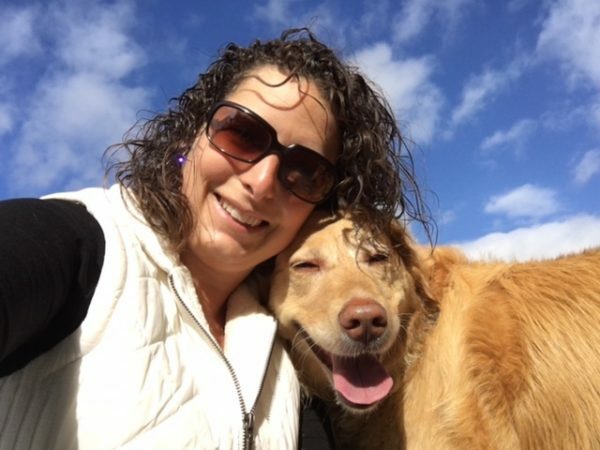 Since those early days of struggling with a diagnosis of ‘brain cancer’ and helping her family navigate the health care circus, Risa has continued to grow both as a human and a nursing professional. Our staff still talk about her more as a friend than as a patient. Her warmth and openness made caring for her and caring about her an example of why nurses love their work. She brings great joy to her patients and of course, anyone who happens to be around her. Her infectious smile and sincere compassion continue to help others as they travel on their own journeys.